As a community manager you can install the Google Drive Files & Docs add-on for your community users to let them enable creation of Google documents, spreadsheets, and presentations in places they own. Upload files to Jive and store them in Google Drive. Upload files or add Google Docs in Google Drive and sync them back to Jive. Create Google Docs in Jive. Sync Jive comments on a Google Doc with document-level comments on the same doc in Jive. Once you install the Google Drive Files & Docs add-on and set it up, users can connect places to Google Drive and use it as the external file storage as shown below. 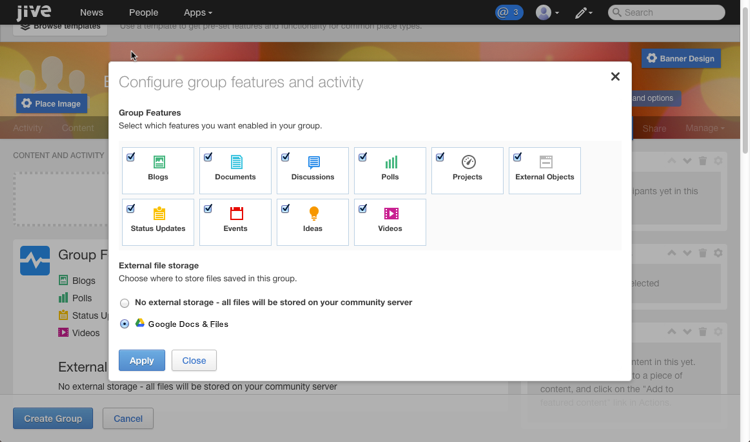 Note: When connecting a Jive place where everyone in the domain can view content, such as open groups, the integration adds the "everyone in the domain can view" rule to the connected Google Drive folder. Make sure these system requirements are met before using the add-on.